Aldi came out with a bunch of fancy Greek yogurts this month, and I bought every single one. As much as I hate to admit it, I'm slowly but surely joining the cult of Greek yogurt addicts. All of the fancy flavors and things to review are Greek these days, so there's really no avoiding it from a food blogger standpoint, but it really is growing on me. Enough rambling, let's see if this yogurt is as "indulgent" as it claims to be. The packaging for this is pretty darn fancy for an store-branded item. 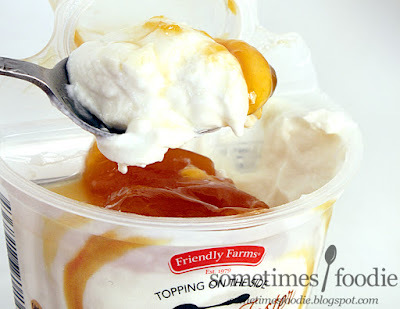 The yogurt and caramel are obviously separated, so those caramel swirls on the front of the container aren't real. It's just a printed image. It look pretty realistic though, right? I really like the imagery used for this product, and even though the typeface looks a little greeting-card-y, the overall layout and design is very nice for a product at this price point. My only complaint would be that the nutritional information wraps around, so it's tricky to read. With compartmentalized packaging like this I don't really know what alternatives the company would have to make this more easily read, maybe printing it on the foil lid? Anyway, this is a pretty nicely packaged product and it functions well. I peeled back the lid and the product is exactly what you would expect. 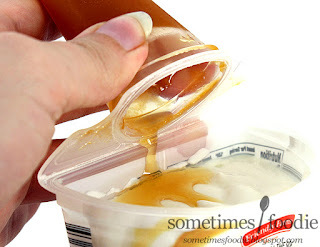 I have a small compartment filled with a caramel sauce, and a slightly larger compartment filled with banana Greek yogurt. Folding the caramel portion over so that it poured onto the yogurt was very easy, unlike other similar containers. I did notice that the caramel was a bit thicker than I expected. Yup, that's a big ol' blob of caramel right there. 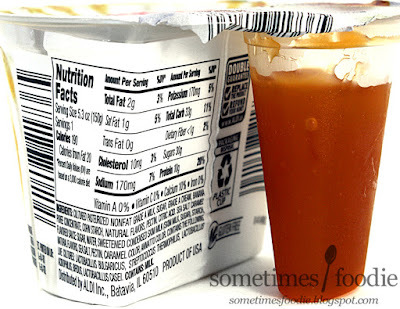 It's consistency is more like the caramel ice cream topping that comes in glass jars than a pump or a squeeze bottle, so it didn't really "pour" as much as just "plop" into place. I scooped up a spoonful of yogurt with some caramel to give this a taste before trying each element on it's own. Combined, this is pretty decadent. 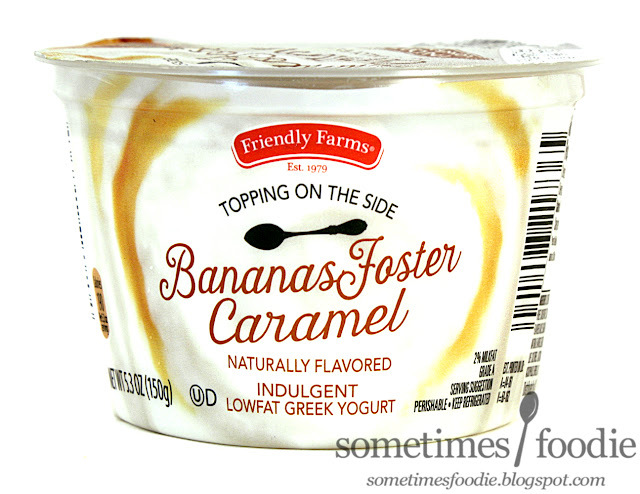 I wouldn't say it's as rich as actual banana's Foster, but for a yogurt, it's pretty darn good. The yogurt on it's own has a light banana flavoring that is sweet and a little caramelized, but very subtle. Kind of like overripe bananas were mixed into a very large container of yogurt, but it's light and not nearly as intense as a real banana on it's own. As for the caramel, it has a bizarre texture, kind of like a jelly, but not really. It's hard to describe it's mouth-feel, but it tastes like a traditional caramel topping for ice cream. It's sweet with burnt sugar notes, and it works well with the banana, but it does overpower it a bit. I love bananas, so I was really excited to try this one, but the caramel easily takes over the banana-iness. I almost feel like we got too much caramel-to-yogurt with this duo, but I did enjoy this a lot and it was very sweet and dessert-like for a Greek yogurt product. I've had a name brand yogurt with the same concept and flavoring, and of the two, I actually like this one more! 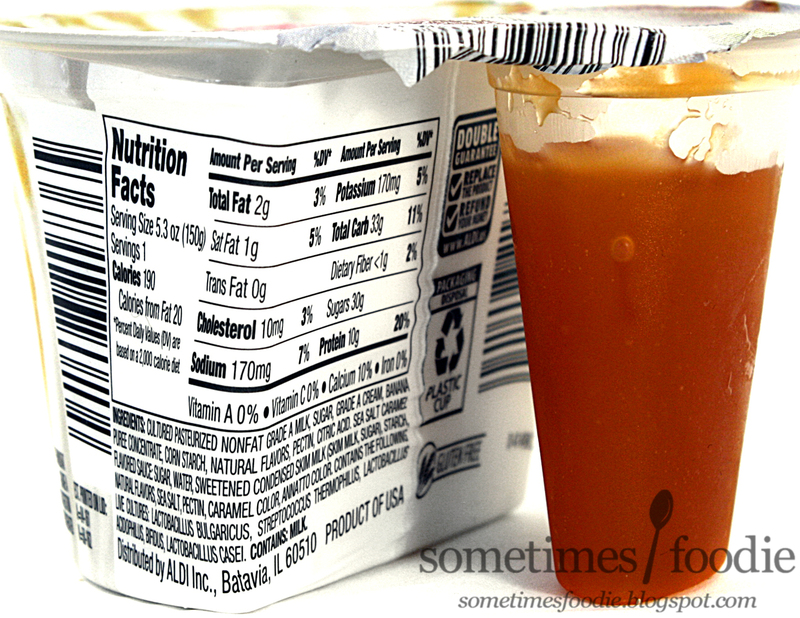 This allows me to control my caramel-to-yogurt ratio, and next time I'll know not to dump the whole thing into it.